22, Jalan Seri Taming 3B, Taman Seri Taming, 43200 Selangor, Malaysia. 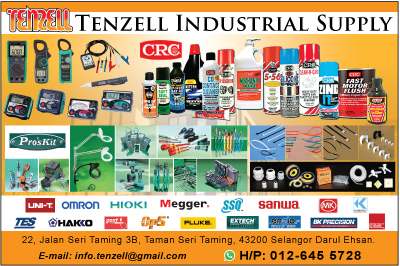 TENZELL INDUSTRIAL SUPPLY is a distributor, dealer and value-added reseller of electronic component solutions, hardware, paint and etc. for today’s "connected” world. We are NOT a general line distributor or a broker. We are a "niche” distributor, a specialist. We firmly believe in the intrinsic value of distribution, a value that can be appreciated by all of our valued partners…customers, component manufacturers and the local manufacturer’s representatives. We provide technical assistance, arrange for samples, provide accurate price and delivery quotes, coordinate follow up between the customer, rep and manufacturer, take orders large and small, offer value added customizing capabilities, and offer innovative inventory management solutions.